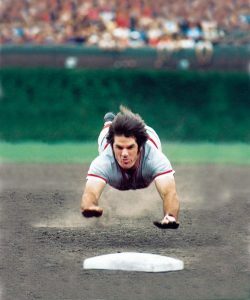 Nobody ever accused Pete Rose of the Cincinnati Reds of being a fabulously athletic baseball player. He was of only average height, stocky in build, a good enough runner but nothing like those (mostly black) players who go from first to second base as if jet-propelled. He didn’t hit with great power, either. But he did HIT — like few players, before or since — from both sides of the plate. Well enough to win three National League batting titles. With a ferocious determination (they said in his playing days, Rose would compute his batting average by the hour.) He was the first player at bat for the Reds before every game. He became known early in his career for sprinting at top speed to first base after drawing a walk. Practically all other major league players would just trot down to first — no hurry, they can’t put me out. But Pete Rose got the nickname “Charlie Hustle” for his dead run to first, for his pounding around the bases with massive determination, though not great speed, for his outfielding (and infielding — he played five different positions as a Cincinnati Red) in the same way. Pete Rose was there to win, in any way he could (within the rules, that is). best major league ballplayer of all time. Cobb’s 4,191 career hits was the largest number ever achieved by any player for almost 60 years. But Pete Rose, who just wouldn’t quit or ease off, kept rapping away at that record. n’t know if Pete has ever said that, in so many words. But baseball was his obsession from the time he was old enough to lift a bat and throw and catch a ball, on the streets and playgrounds of his working-class neighborhood. Pete was a kid who was driven to excel at his favorite sport — baseball, naturally — to give 110 percent every minute, to never let down, to slide head-first into bases, to race as hard as he could move to catch a fly ball. And not to “trot” to first after a walk. At age 22, Pete’s lifelong dream came true: The Reds, his beloved home-town team, called him up from the minors. And that’s when it all began. Pete was always friendly to anyone who he was around, who wanted to chat: teammate, fan, man on the street, whoever. He often helped young rookie players with advice, encouragement, and the like. Many people who reach a pinnacle of fame, on TV, in the movies, in professional sports, develop an air about them that says, “Hey, peasant, I’m a big star! I’ve got important things to do, with important people. I’ve got no time for YOU.” But Pete Rose was never that way. The records began coming, like three National League hitting championships. Only three in 24 years of major league play, you say? Keep in mind, he had more at-bats than anyone else in baseball history — 14,053. Ten seasons with 200 or more hits. An all-time record of having played 500 or more games at each of five different positions during his career. The most singles of any player — 3,215. Add ’em up: 17 all-time major league records held by Peter Edward Rose. Traded to the Philadelphia Phillies in 1978, Rose helped them to win the 1980 World Series. Traded back to the Reds in 1984, Pete was still knocking away at Ty Cobb’s career hits record. And then, on Sept. 11, 1985, Rose was tied with Cobb at 4,191 hits. Leading off against the visitors in a game at Cincinnati, Charlie Hustle went to two balls and one strike — then hit the next pitch solidly into center field. Four thousand, one hundred ninety-two! A new, all-time hits champion! The capacity crowd, standing almost to a man, applauded and cheered — and applauded and cheered — and applauded and cheered. Eight minutes, nine minutes, 10 m inutes elapsed, with Rose standing at first base, being congratulated personally by his teammates, members of the other team , his boss, Marge Schott; all and sundry. He waved to the crowd, doffed his cap repeatedly, mouthed “Thank you’s” by the score, and finally began to look a little embarrassed at all the fuss. And finally, as the ovation continued without let-up, Pete got emotional. He ducked his head, wiped tears from his eyes. When his first base coach approached, Pete buried his face in the coach’s shoulder for a few seconds, embarrassed that he had broken down. And finally, when his son “Petey” Rose, also a member of the Reds, ran up to hug his father, Pete let all the tears out, his face against Petey’s as he showed the inner Pete Rose as he never had before on the field. The crowd loved him. He was their fellow Cincinnatian, that guy from Western Hills who never gave up. He was THEIR Pete Rose. Pete wound up with 4,256 hits for his career. He became the Reds manager. Time went on. And then, in 1989, proof was uncovered that Pete Rose wasn’t perfect, after all. He had been betting on the Reds’ games, as manager, and heavily. A practice absolutely verboten by major league baseball. After an extensive investigation, with Rose insisting that he never bet on baseball, National League president and later baseball commissioner, A. Bartlett Giamatti, barred him from baseball for life, on Aug. 24, 1989. Interesting enough, Giamatti then dropped dead of a heart attack on Sept. 1, 1989 — just eight days later. Bad karma? Oh, I won’t say that. But it makes one wonder, doesn’t it? Later, on Feb. 4, 1991, the Hall of Fame voted to ban anyone on the “permanently ineligible list.” Translation: Peter Edward Rose. The powers that be in baseball wanted to make sure that Charlie Hustle never got to join the other great baseball players in the Hall. Giamatti’s successors as the baseball commissioner — Fay Vincent, Bud Selig, and Rob Manfred, respectively, gave him no encouragement that they might ever relent and allow his name to be put on the ballot for admission to the Hall. Manfred has been a little looser, a little more understanding, but he appears to feel that Giamatti might come back and haunt him if he ever relented about the ban. Pete Rose has tried, repeatedly, to get the commissioners to relent — to no avail. But he doesn’t waste his time sitting at home worrying about it. He has numerous business interests, travels extensively, meets the public frequently, spoils his grandchildren, and is enjoying a happy sunset of his life (he’s now 76). But denial of a place in the Hall has to gnaw at him. And, on Sept. 11, 2010, the 25th anniversary of his 4,192nd hit, friends and admirers of Rose held a roast of him at the Hollywood Casino in Lawrenceburg. After the usual teasing and joking a “roastee” always takes, laughing louder than anyone else, Pete Rose got up to speak. Many of his former teammates were there. After thanking all those responsible for honoring him, Rose again did something unusual for him. He got emotional. Yes, he did some things he knew he shouldn’t have done. But does anyone think that all of the other major league players in the Hall were angels, pure as the driven snow? HA! And I doubt that many of them set as many major league records as Pete Rose did. Or showed his determination and energy. Or played as many games. Or had a 44-game hit streak. Or beat Ty Cobb’s all-time hits record. Come on, baseball moguls: Charlie Hustle belongs in the Hall, and you know it. Let him be nominated, and elected, while he’s still around to enjoy it. 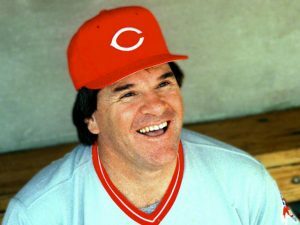 Why, I’ll bet American baseball fans would stand, applaud and cheer for you, for as long as those Cincinnatians did for Pete Rose after his 4,192nd hit. Well, probably not QUITE as long. After all, you’re not Pete Rose. And here’s one more point. Imagine, if you will, that Pete Rose was black, but everything else was just like it really is. Can you imagine what the race hustlers would be saying about that? Can’t you imagine the protests, the riots, the screams of “Racism!”? Amazing story, Old Corporal. Stats are usually boring to me, but you made them interesting and I sure enjoyed reading this! I add my wish to yours…I’d like to see Rose in the Baseball Hall of Fame, too!